After milling a few pieces of wood by hand, tedium is the first feeling that sets in. This is then followed by frustration, annoyance, even anger at oneself as we struggle to keep multiple pieces not only perfectly square but at the necessary dimensions with respect to each other. If one doesn’t quit, we quickly wish for machines to mindlessly fix the deficiencies in our work. I’m no hand tool snob or Luddite, after all technology pays my bills, but when I don’t have a planer or jointer at hand, I have to ask myself why am I spending my weekend doing this work. Is there value in this work other than trying to reach the end? When we live with a process that frustrates us, to stay sane, we have to troubleshoot and change things. In my case, it was first building a planing beam that would provide a reliable reference surface for my milling. Next, it was realizing that my plane blade was ever so slightly not square and causing one edge of the plane to dig deeper into the wood. Like a fractal, the closer we look, the more we notice and learn. Besides improving our technique and adjusting our tools, we also learn, often rather painfully, that your mind should not wander. 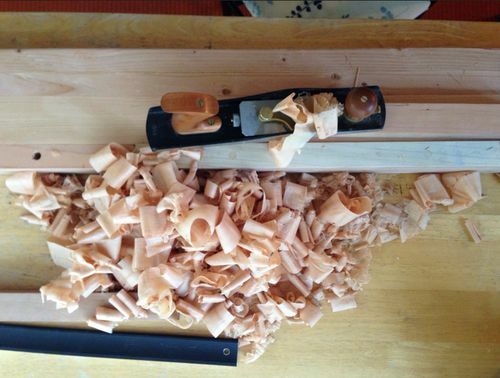 When it does, the shavings become uneven, skewed, and out of square. A machine may require a few moments of focus to setup and to be operated safely, yet milling your stock by hand requires focus for a considerably longer period of time. Perhaps this is why a lot of handwork, like freehand sharpening, gains a meditative quality–not the relaxing type, but the strenuous type. Our mind isn’t wandering off to day dream, but quite the opposite, it’s flexing to remain singular in focus. This is how I can rationalize performing pre-industrial work like milling wood by hand for hours on a weekend. The end result is usually uneconomical, imperfect, frustrating, and frankly puzzling to explain or justify. In the end, it must be the process that has value: to train our mind to be patient, forgiving, and be able to keep focus for longer and longer periods of time, and in turn, to see more than we saw before.